Keyword research tools come in all shapes and sizes. However, the needs of every business are different, and what works well for one business may not work at all for another. Given that keyword research is vital to the success of your SEO and PPC efforts, it stands to reason that the keyword research tool you choose is of equal importance. If you're just getting started down the road of keyword research and you want to use a free online tool, there's no reason to look further than the new and improved Free Keyword Tool by WordStream. Using WordStream's Free Keyword Tool is easy. Simply enter a keyword in the relevant field to get started. You can also enter the URL of a webpage to see keyword data for that page, which can offer a competitive edge to advertisers conducting competitive intelligence research on what their competitors are up to. To maximize the relevance of your results, you can also enter your industry and country. Oftentimes, metrics such as cost-per-click vary widely from one region to another, even for companies operating in the same industry bidding on similar keywords, so the more information you enter, the more accurate the results. In addition to the keyword suggestions provided in the left-most column, you'll see data for four important metrics: Google Search Volume, Competition, CPC, and Opportunity Score. Let's take a quick look at what each of these metrics means. This figure represents the average monthly Google search volume of a given keyword. Our top result - the keyword "cars for sale" - has an average monthly Google search volume of approximately 1.2 million. 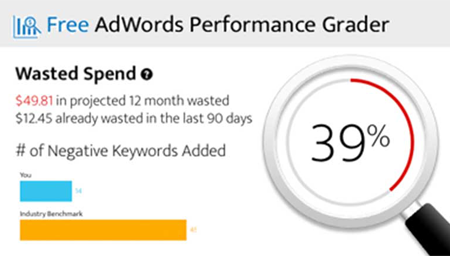 This metric shows how competitive a given keyword is. In our example, we can see that despite having a very high average monthly search volume, the keyword "cars for sale" is only of Medium competitiveness, highlighting a potential opportunity for advertisers hoping to bid on this keyword. Arguably among the most important of all PPC metrics, CPC (cost-per-click) represents how much an advertiser will be charged every time somebody clicks on an ad featuring that keyword. Although it's important to view CPC within the context of other metrics, it can be a pretty good indication of how bidding on certain keywords may affect your ad budget. This proprietary metric is unique to WordStream's Free Keyword Tool. Represented on a scale of 1-10 - with one being the poorest and 10 being the best - Opportunity Score shows advertisers which keywords offer the most impactful opportunities. This can be immensely valuable to advertisers with limited resources, allowing them to quickly and easily identify keywords that can move the needle of a campaign, saving advertisers precious time. The Free Keyword Grouper: This tool automatically groups a list of up to 1,000 keywords into clusters of related terms. The Free Keyword Niche Finder: Enter a keyword to discover potentially profitable keyword niches. You'll get back highly relevant keyword groups that easily translate into a well-organized PPC campaign structure and SEO-friendly website architecture. If you’re determined to get the most of your keyword research, then you need to use the WordStream PPC management solution as your keyword research tool. The keyword research tools in WordStream Advisor were created for the professional search marketer who is looking for unmatched value, productivity and keyword intelligence. Infinite stream of personalized keywords – Everyday, WordStream delivers a list of newly discovered keywords that are harvested from your own, private AdWords search query reports. Since these keywords are from searches used to find your ads, they are highly relevant and personalized to your business, your product or service, and your bottom line. Keyword data based on real metrics - WordStream "trues" your keyword research, basing it on real searches and actual outcomes on your website, rather than traffic and conversion estimates. Actionable keyword data – WordStream’s keyword research tools go beyond static keyword research, by giving you the power to group keywords and organize massive lists of new keywords into tight, focused clusters. Being more query-specific will increase your exposure in the search engines and boost traffic and conversions for PPC. You’ll be adding more productivity, exploring new search verticals, gaining higher relevance and generating greater profitability for your search marketing efforts. Let’s now look at one of the most unique features of the WordStream keyword research tool: keyword discovery. With WordStream, keyword research moves from guess work to certainty. WordStream feeds you the specific keywords that searchers have used to land on your paid search ads and take action. These real keywords flow into your QueryStream so you can add them to your ad groups or set them as negative keywords, as needed. With a daily flurry of fresh keyword research activity, you’re able to target new search verticals and explore more channels for additional revenue streams. Learn more about WordStream Advisor.